play Hawick Town Hall ,UK tonight. And while doing so their first national broadcast hits the radio waves via the John Peel show. In session tonight features 4-Stranglers tracks by the band for BBC Radio one featuring 'Hanging Around', 'I Feel Like A Wog', 'Goodby Toulouse' and 'Something Better Change'. Ramones release their second 45 on Sire Records and it has nothing to do with sniffing glue or copyrighted brand names and is guaranteed not to upset anyone. "I Remember You" doesn't tear along at 100 mph. 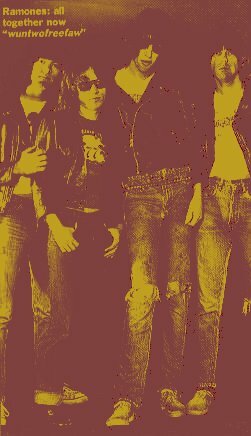 It's actually a melodic , medium tempo, pop song that can be found on the band's troublesome second album, "Ramones Leave Home". It's backed with two live songs, "I don't wanna walk around with you" and a surfin' cover of the Riverias' "California Sun". Play the last of the 2 nights at the Rainbow Theatre London, UK, endng the first first leg of Iggy's tour in Europe. Iggy will return Stateside before resuming the tour in Montral later this month. the geeky side of the New York new wave scene release their debut 45 today on Sire Records (The Ramones label). It feature 2 David Byrne compositions 'Love Goes To Building On Fire'/'New Feeling' The trio consist of David Byrne vocals/guitar, Chris Frantz on drums and Martina Wymouth on Drums.